Alas! The Berlin Wall Still Stands | McKaff's Blog! ← Snowden Effect: Would Nigerians mind such intrusions? It was beamed to the screens on the 9th day of November, 1989 as the almighty Berlin Wall was being chipped down by countless people who felt free to be part of the ‘real’ world. 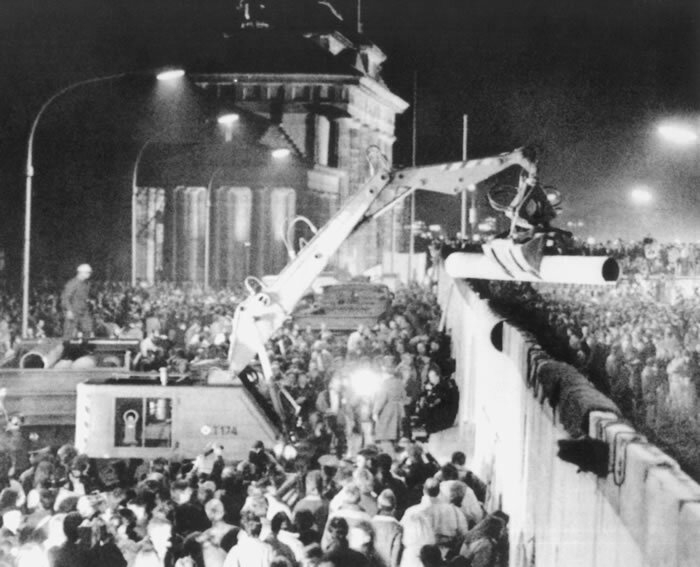 The wall, built in August of 1961, the physical separation of the Germany into East and West, but the somewhat logical separation of the world into being communist or capitalist. More importantly, the Berlin Wall symbolized the Cold War between the Soviet Union and the United States (and its allies). It is true that there was no real shot of fire nor any drop of A-bomb by either side during the Cold War, but the world nonetheless felt the shockwaves of moves and inactions of the two superpowers. As each campaigned the world over for the establishment of its ideals of economy and politics across nations; it happened that virtually all the existing countries then chose either of communism or capitalism; or aptly put, chose to be on the either side of the Wall. The “war” would be credited with both the arms and space race though. We saw the Soviet Union ensuring it detonated its own A-bomb in 1949 (4 years after America’s; show of might maybe). We saw the formation of NATO on the Allies side and the Warsaw Pact on the Union’s. There was the Soviet’s Sputnik in 1957 and the America’s creation of NASA in 1958 leading to Apollo11 years and other space triumphs. In retrospect, it would not really be an overstatement to say the world actually benefited from the war considering the gains of the technologies emerging from the crisis. Even though not many countries currently proclaim communism as the de facto system of government, yet it is very easy to realize that not much has really changed in the relations of the warring countries post 1989. We have all seen series of vetoes of interest at the floor of the United Nations Security Council by Russia, China and United States, with Sino-Russia most often on the same side. We have also seen spies being caught or accused of espionage by either side…….. and then came the proliferation of super high information technology solutions, and the cyber war began. With Edward Snowden’s leaking of US classified information including the revelation that America has been intruding into many Chinese government computers (though China may not be too clean of the inverse allegation too); and the refusal of the “other side’s governments” to play along with the States in detaining and extraditing him, it’s easy to say that the competition is still on. Ironically, the preaching from the business schools and writers is that enterprises and governments are already doing away with competition and accepting the ethos of cooperation instead. Really we have seen the effects of the “supposed” cooperation in trade, with China allowed into the World Trade Organisation (WTO), prices of commodities gone down owing to the abundant cheap labour available in China. This freed up the Western brains for research and development, and the production goes to China again, and the cycle continues. We have also seen more of China in Africa, with China’s investment rising from only $9bn as at 2000 to $200bn in 2012 – well, maybe it’s a segment of a new war that Africa is benefiting though. We have also seen astronauts from Canada, America and China in the same shuttle orbiting the skies and bringing down information that might benefit us all. However, the naked truth as being evidenced in the ongoing Snowden’s saga revealed more of ensuing competition than cooperation. More of espionage activities than sharing, and more of betrayal than friendship. Look long enough at that long wall reportedly being demolished in 1989 and you will agree with me that the Berlin Wall still stands. Share your thoughts on the ongoing frosty relations among the Cold War players by dropping your comments below. This entry was posted in Government, Politics, Technology and tagged Africa, America, Berlin wall, China, Cold War, competition, cooperation, edward snowden, espionage, fall of berlin wall, Russia, Snowden, spy. Bookmark the permalink.